Handheld showerheads bring a lot of convenience and versatility you don’t get from a standard fixed showerhead. Namely, you can more easily clean yourself, the shower wall or tub, and pets. The large droplets produce a satisfying warmth and coverage, while the magnetic dock makes this showerhead convenient to use. The conventional “holster” style dock is prone to instability and the handheld falling out. With this shower head, you can be sure it’s going stay pointed correctly and not fall out of the dock if you bump the hose. 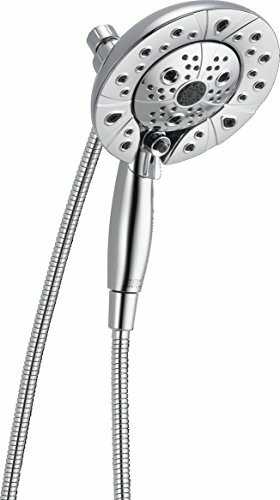 What makes a great handheld showerhead? Picking up or putting back the showerhead in its dock should be easy and not require too much readjusting. Strong water flow with at least one hard and soft flow setting. Hose that doesn’t coil up. Preferably metal. Metal connections for the shower arm and hose are preferred. “Trickle” function for reducing water flow without turning off valves. Regarding functionality, being able to undock and dock the showerhead easily has a huge impact on ease-of-use since you’re likely to be doing that multiple times during a shower. Having a clumsy dock means the showerhead will fall out or cause you to have to readjust the spray direction repeatedly. If you require seated showering then a handheld with an adjustable height bar is a great option. It is also more comfortable for elderly individuals to shower. 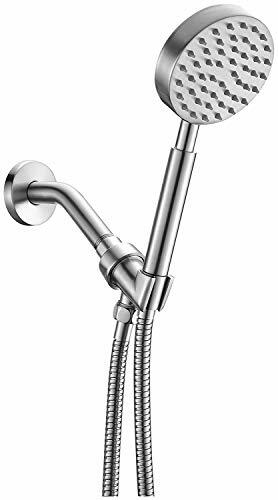 With this type of showerhead, they do not have to shift around in the shower to properly rinse off. For this reason, we’ve included a top recommended model with an adjustable height bar for the handheld. If so, then you know how difficult they can become when it is time to give them a bath. When you have a shower head that is not fixed to the wall, getting the soap out of their fur is a lot simpler. The “trickle” function allows for nearly stopping the water flow while not losing the temperature settings you’ve adjusted to. It’s convenient, but not all showerheads have this function. However, it’s very easy to add a trickle valve before the shower head connection. 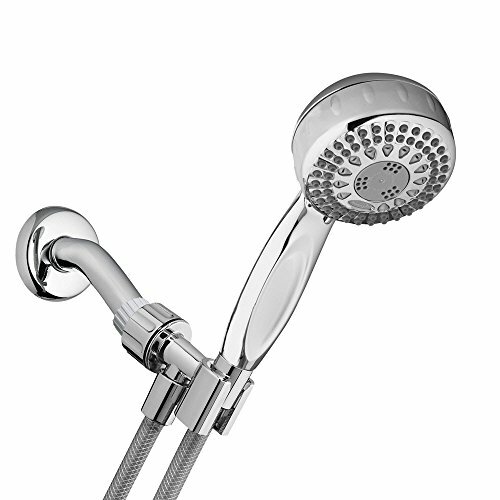 Plastic is hard to avoid, but perhaps the most important part of the showerhead you should having plastic is the main connection to the shower arm. Adjusting the angle of the shower head puts a strain on the plastic which will eventually fail. Plastic threads can easily be damaged if you aren’t careful about attaching the showerhead, and they won’t last as long a metal. 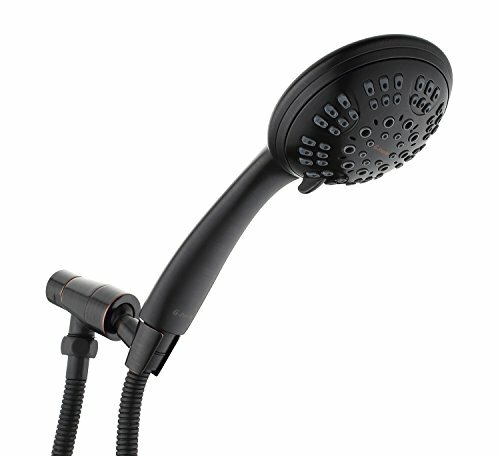 There are great handheld showerheads that aren’t solid metal and are made of coated plastic. We’re going to recommend a couple of our favorites below, but first we’re going to take a look at solid metal handheld showerheads. No chrome painted plastic here. The shower mount, hose, and handheld are all made of metal. The hose is a generous 72 inches long. Maximum 2.5 GPM flow rate. We favor the HammerHead model over the Kohler below due to price and inclusion of parts required for installation. The 4-inch wide handheld face is adequate and have an extra long 72-inch stainless steel hose. There is only one shower function, which is a wide coverage rain shower spray. As of January 2018, the bracket for holding the handheld has been updated to handle the weight better and maintain its position. The manufacturer’s willingness to solve problems and update their product make us feel confident in this showerhead. Plus, you get a 1-year warranty and 90-day Money Back Guarantee. Improved Pivot Bracket has 360 degree rotation. Regarding features, this handheld isn’t impressive at all. But it has it where it counts, and that’s the stainless steel body and hose. The holder for the handheld is made from brass. This eliminates most of the major complaints you will see when reading through reviews of many poorly made plastic showerheads. Don’t forget to add teflon tape, wrapped in the correct direction, when you attach everything together! The Kohler Forte handheld has 4 shower functions and is made of mostly metal. The jets resists hard water buildup and is easy to clean. You will need to buy a hose and mount separately. We’ve included links below to some recommendations. Many color options available, but we’ve linked to the bracket with a Brushed Nickel finish to match the hose and showerhead. The Kohler Forte is a simple, solid metal handheld from a well-known brand. Unfortunately, it doesn’t come with all the parts needed for a complete install. You will need to buy the hose and mounting bracket separately. We’ve included a link to one above, but this particular one may or may not work for you. You could have this handheld be your primary showerhead, or placed off to the side as a secondary. MasterClean Sprayface resists hard water buildup. Hose and Mount sold separately. The higher cost and more involved installation process makes this handheld unattractive to some people, but if you’re willing to do the extra work then we don’t think you’ll be disappointed in the quality of this handheld. Additionally, the Kohler model has more options than the HammerHead. One issue with the Kohler handheld is the grip. It gets slippery when you have soapy hands. Adding a texture would reduce this problem. 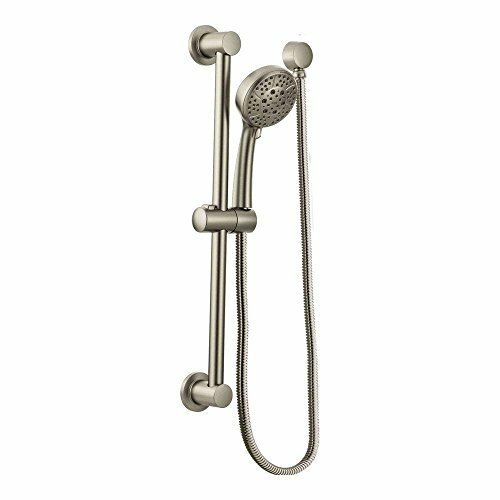 This style of handheld showerhead is very uncommon and there are fixed-style models of this type of shower head as well. It’s more like a firehose than a traditional shower head with and array of small jets. They’re really simple and made completely from metal. 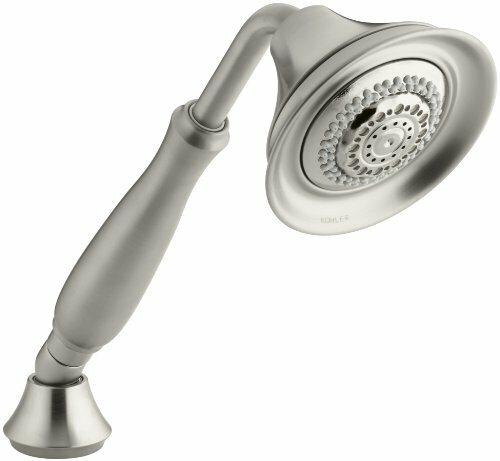 This handheld shower head from High Sierra is in the “Low Flow” category because it only uses 1.5 GPM. The simplified “firehose” looking nozzle produces a satisfying spray despite the relatively low flow rate. You also get an excellent 72″ all metal hose. Control strength of spray or shut it off completely. 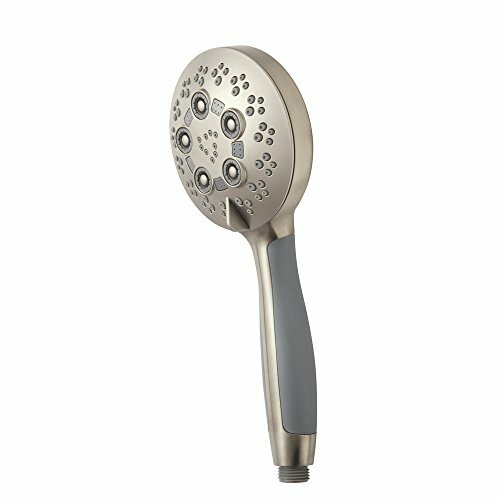 Primarily known for their popular hotel fixed-style shower heads, Speakman’s Rio is a solid choice for a durable ABS plastic handheld. Five spray settings with a total of 147 spray outlets give you a full shower experience. The handheld is easy to grip and isn’t too slippery. The grip and quality of the spray options make this model shine. You do get some rotational freedom with the handheld mount, so using this as your primary shower head is not a problem. G-Promise emphasizes the metal bracket and fittings, which we love. There are several finish options and the handheld is made from durable ABS, just like the Speakman model above. You get 6 spray settings and a flexible 63″ stainless steel hose. 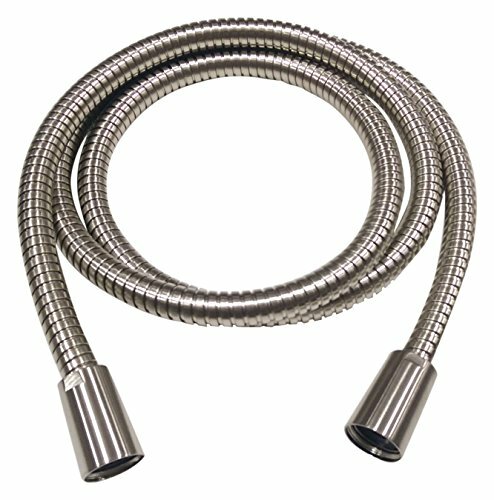 63″ Stainless Steel hose stretchable to 75″. Chrome, Nickel, Oil-Rubbed Bronze finishes available. The handheld bracket is the piece that sees the most wear and tear. Taking the handheld in and out multiple times per shower and adjusting the angle puts a lot of force on the bracket and fittings. That’s why you see plastic brackets and connectors crack and bust over time. Having a metal bracket eliminates much of the trouble associated with plastic shower heads. 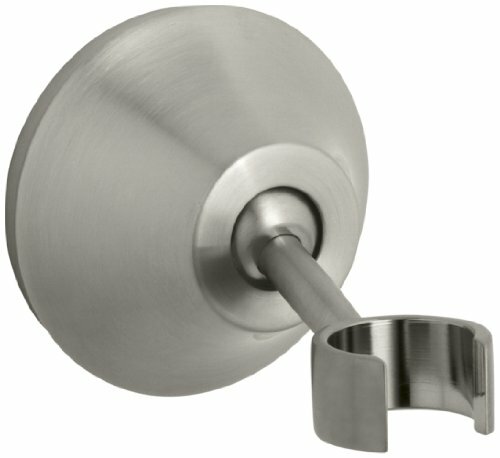 Grab bars are intended to help people with mobility problems and will support a substantial amount of weight. Be sure to follow the manufacturer’s recommendations for installation as these kits need to be anchored correctly. 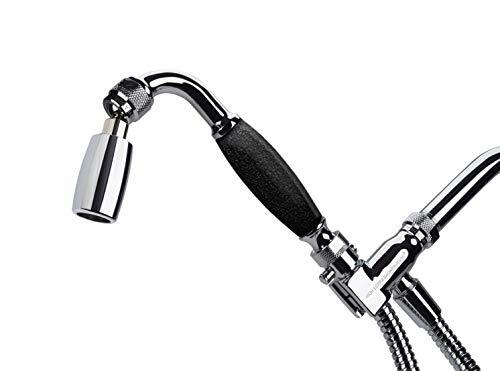 This grab bar and adjustable shower head combo have a sleek finish, has a pause function, and a sturdy 1-inch diameter bar capable of supporting up to 500 lbs of force. The non-rotating bar is a must and adjustable height handheld let you position everything to your liking. The Delta 51900 is an attractive looking ADA shower kit that has all the basics you need. Be sure to pick up the elbow for the handheld hose, as most of these types of shower kits don’t include them. Elbow for hose sold separately. Handheld has Trickle settings to greatly reduce water flow. Not to be confused with the grab bar model above, these shower heads and slide bars are not meant to support the weight of a person. Being able to adjust the height of the handheld dock is handy if you shower while sitting, or have animals that you bathe in your shower. The slide bar is not meant to be used as a grab bar (not ADA compliant), but rather to adjust the height of the handheld. The 4 spray modes and 69″ metal hose give plenty of freedom of movement and spray pressure. The total length of the slide bar is 30 inches. Be sure to pick up the elbow for your handheld hose to attach to, and make sure you get the matching color. Sliding bars give you the ultimate freedom in positioning your shower head vertically. If you’re tall or require seated showering, you can get the height positioned just right. This is a different approach to the adjustable height shower head. The metal strip with the magnetic bracket is a simple way to adjust your shower head height. No screws or drilling necessary. Instead the strip is attached with waterproof adhesive pads. The steel strip is 18 inches long and requires no screws to install. That means you won’t have to drill into your tile. The adhesives work very well in holding the strip in place. It’s important to follow the installation instructions and make sure the strip doesn’t straddle grout as much as possible. For example, if your tile has consistent vertical grout lines then place the strip such that only the horizontal grout lines are under the strip. No screws or drilling necessary. Magnetic Bracket for holding the handheld. These handhelds didn’t make our top list, but they are very popular for one reason or another. These are reasonably good alternatives that have an overall positive reviews. The Moen Magnetix handheld is one of our favorites. The ratings on the plastic models above are a little stronger, but the magnetic mount is an incredibly convenient feature that is hard to overlook. Seriously, consider this shower head if you didn’t like the plastic models above. The Magnetix docking is very convenient and makes this handheld stand out. We mentioned in our first outline of desirable features that we wanted easy docking and undocking of the handheld. The Moen Magnetix does it best, but we prioritized metal fittings above that added convenience. That doesn’t mean you have to. This Waterpik handheld is nothing special but is a fairly popular model with good reviews. It lacks the convenience of the magnetic dock, but is a more affordable option. If you’re going to buy a plastic model it’s always a good idea to make sure it has a warranty. This Waterpik has a limited lifetime warranty, so it’s definitely worth considering. 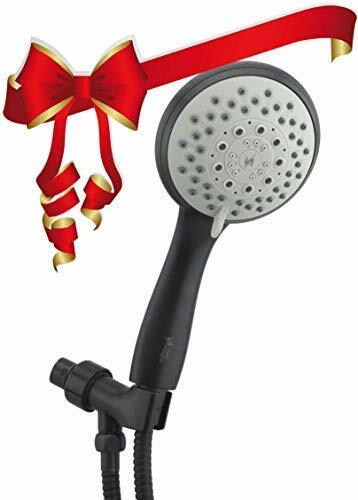 This shower head continues to be highly rated and comes with a 3-year warranty. The face is easy to clean and mineral build-up won’t be an issue. The flow restrictor is easy to remove as well. This Vida handheld is another great budget choice with a solid brass connector/ball joint and hose. This model has overwhelmingly positive reviews and has a 3-year warranty. Usually, when you see leaks from a shower head immediately after installation, it’s because you didn’t use Teflon tape or didn’t put it on properly. Be sure to check that the tape is wrapped in the right direction before giving up on any shower head. Solid brass ball join and connector. Flow Restrictor is easy to remove.